I took this photograph last week on a day trip to Bray. It was great to see both young and old enjoying themselves on the seafront in the glorious sunshine. As I walked along the promenade I thought about all the times the Ma’ and Da’ brought us here on the excursion buses from Cabra West. I remembered sitting on the grass at the foot of Bray Head eating tomato and cheese sandwiches and drinking tea from a flask. One time myself and one of my brothers went up on the chairlift that brought you a bit of the way up the Head. We had stones in our pockets and threw them down at the courting couples lying in the tall grass below. The water in Bray was always freezing and the breeze coming in off the Irish Sea would shave the hair off a goosegob. No matter where you sat on the beach or on the grass there was always some ould fella listening to a Gaelic Football match on a transistor radio. Mehal O’Heir could be heard all over the place screaming ten to the dozen about the ball going over the bar. I also remembered cycling out to Bray from Cabra with a few of my pals on bicycles we had made up ourselves. We’d go into Woolworths in Henry Street of a Saturday and shop lift bits and pieces for the bike. We’d have coloured tape and a bell and maybe a mirror too that we’d spend hours putting on the bike to make it look cool. As I walked along I also wondered how many people from Cabra had actually been to Bray over the years and did they too have similar memories to me. 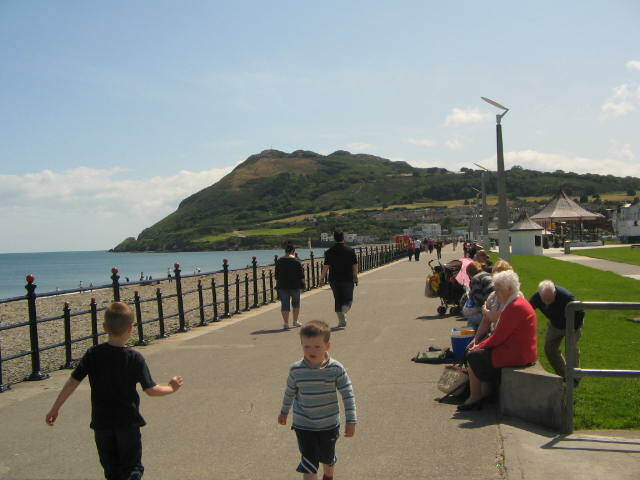 That little stroll along the promenade in Bray with the sun smiling down on everyone was a glorious moment in time for me. I hope you too have good memories of your time in Bray.